The HERCULES Series Premium Plastic Folding Chair is suitable for school functions, banquets, sporting events, parties, graduations and more. 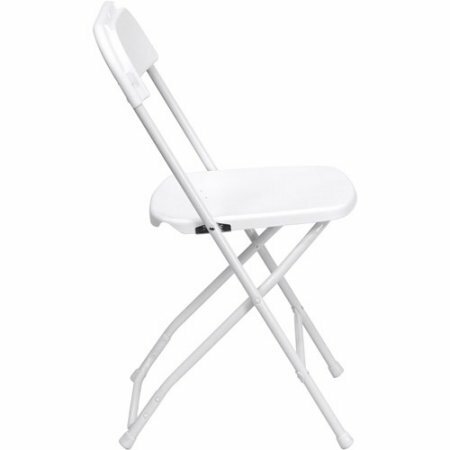 This Hercules Folding Chair, set of 4, is lightweight, making it easy to carry and set up. It features an 18-gauge steel frame with double support rails that can hold up to 800 lbs and an open-back design that will support a variety of body types. The back and seat are constructed of white plastic, with a textured surface for a neutral style that will coordinate well with any venue. Non-marking floor caps make it convenient to use on bare floors because they won' t leave marks or scratches. This white folding chair nests easily for easy stacking. It is convenient to use indoors or outdoors.